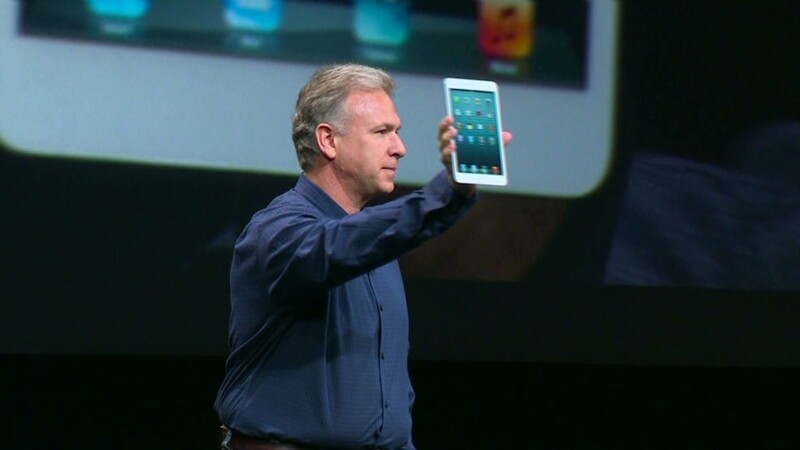 Apple on Tuesday unveiled a smaller iPad, dubbed the iPad mini, at a highly anticipated event in San Jose, Calif. The device, which has a 7.9-inch screen, is one-third smaller overall than than its 10-inch cousin and weighs less than a pound. It's also 23% thinner than the full-sized iPad. The iPad mini will hit stores on Nov. 2, starting at $329 for the 16-gigabyte, Wi-Fi only version. Larger 32 GB and 64 GB versions will cost $429 and $529, respectively. Apple will begin taking pre-orders on Friday. Like the full-size iPad, the iPad mini has versions that connect with 3G and 4G cellular networks from Verizon (VZ), AT&T (T) or Sprint (S). The cellular iterations, which will ship in mid-November, will cost $459, $559 and $659. Apple boasted that the iPad mini weighs less than most rival seven-inch tablets, including the Amazon Kindle Fire and Google Nexus 7, but features a 35% larger screen than those competitors. It also comes with a 5 megapixel rear "iSight" camera and a high-definition, front-facing camera for FaceTime video chats. The iPad mini will run Apple's new iOS 6 software, complete with Siri and all of the other features available on the iPhone and larger iPad. The mini iPad has the same 10-hour battery life as its bigger relative and the same screen resolution as the still-available, year-old iPad 2. It also features Apple's new Lightning connector and a smaller "smart" cover. Apple also unveiled a slightly updated fourth-generation traditional iPad at its event, with a new, twice-as-fast processor and U.S. 4G-LTE coverage. The new iPad comes with Apple's Lightning connector. Previous versions featured the significantly larger 30-pin connector that Apple has used since 2003. Apple's 9.7-inch iPad lineup starts at $399 for the iPad 2 and $499 for the fourth-generation iPad. Shares of Apple (AAPL) were down almost 2% shortly after the event. Since the iPad debuted in 2010, no tablet challenger has come close to unseating it. Apple held a 70% share of the tablet market in the second quarter, according to the latest data from IHS iSuppli. Amazon's (AMZN) Kindle Fire HD and Google's (GOOG) Nexus 7 both come with seven-inch screens and $199 price tags. Though they haven't threatened the iPad's dominance in the tablet market, they have sold well enough to get Apple's attention. Apple could potentially stomp out the competition with a lower-cost, smaller tablet of its own. Ahead of the announcement, Wall Street analysts predicted that the iPad mini would keep small tablet competition at bay. Even though the iPad mini is considerably pricier than small-tablet rivals, industry analysts expect that it will vastly outsell its competitors. "The iPad mini is the competitions' worst nightmare," said Shaw Wu, analyst at Sterne Agee. "Competitors are already having a tough time competing against the $399 iPad 2 and $499 iPad, and we believe lower price point iPads will make it even more difficult." Apple's announcement comes ahead of another big tablet launch this week: Microsoft (MSFT) will be releasing its Surface tablet on Oct. 26 -- the first tablet of its own design. Macintosh: Before showing off the iPad mini, the company also unveiled a new lineup of Macintosh computers, including a 20% thinner and one-pound lighter 13-inch MacBook Pro with a Retina display. The company also updated the $599 Mac Mini. The most impressive new Mac is the iMac all-in-one computer, which comes with a 45% thinner display and is a remarkable 80% thinner at the edge. That makes the computer eight pounds lighter. The new iMac has an option for a new "Fusion Drive," which combines flash and hard drive storage for faster reading and writing. Apple also introduced a new iBooks app for the iPad and iPhone, with continuous scrolling (no more "flipping" through pages), and new sharing options.